Mantras originally came about as sacred words or phrases to repeat when meditating to help you shut out external noises and thoughts; read your phrase to inspire and motivate you through the day. 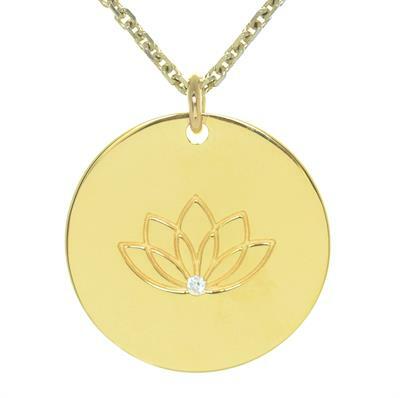 This 18ct Gold Plated 925 Sterling Silver disc pendant hangs from an 80cm chain, designed to hang close to your heart. With a lotus design engraved on one side, and a sparkling Zirconia accent, choose your mantra to be engraved on the other, creating a truly unique pendant made just for you. This pendant comes on a personalised myMantra card featuring your chosen mantra.